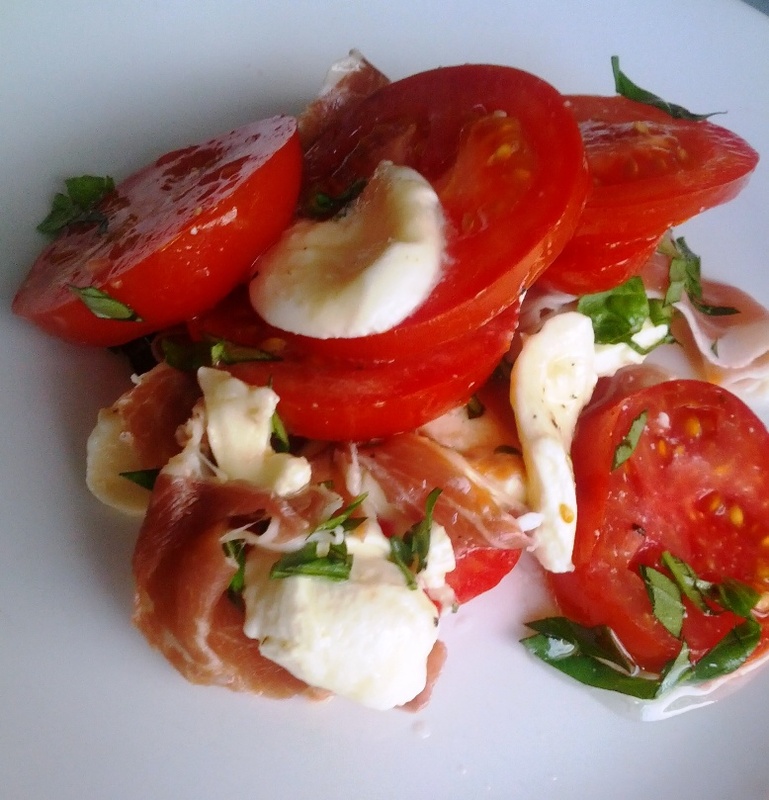 Super quick, healthy salad for the start of the week. Great flavours from a few key ingredients. To make the glaze, combine miso, mirin, sugar & water & mix well. Combine all the dressing ingredients in a small jar and shake well. In a bowl mix prepared carrots, chilli & ginger with the dressing. Place salad onto large platter and toss with vegetables. Heat a large pan over a high heat. Spray with oil. 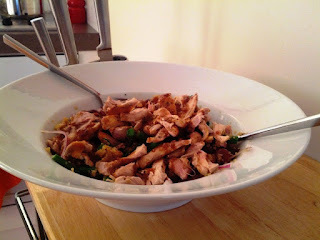 Add salmon & cook quickly for 1-2 minutes until almost cooked. Reduce heat to lowest setting and add miso glaze. Toss to coat salmon pieces, cook for 1 minute and remove from the heat. 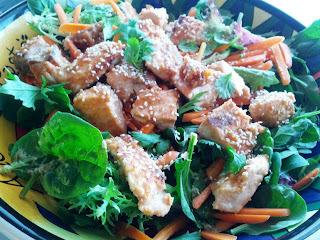 Top salad with salmon pieces and any remaining glaze. Sprinkle with sesame seeds & torn coriander leaves. Bon appétit! To save time you can grab a ready-roasted duck from your local Asian supermarket. I prefer to roast my own as you get more meat and know how its been cooked. In a jar place all the dressing ingredients, adding salt and pepper to taste, then shake well. Always thaw your duck legs before cooking. Smooth the duck legs out and remove any excess fat around the edges. Score the skin all over - this will allow the fat layer under the skin to render, during cooking. Rub salt & pepper into the skin. I left mine in the fridge overnight, it gave the duck a nice salty flavour that balances well with the rest of the ingredients. Place duck legs skin side down on an oven rack, for about 1 to 1½ hours, turning about ½ hour before the end of cooking. Remove the legs from the oven and rest for 10 minutes. Strip the duck from the bones, discarding all skin, bones and fat. 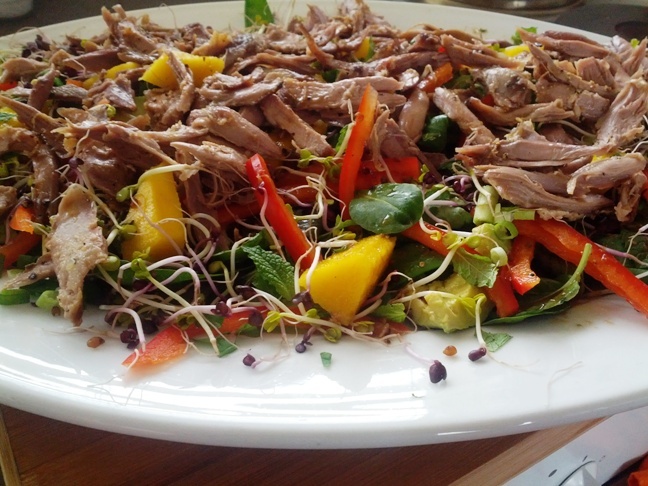 Toss the duck meat with half the dressing. Pour boiling water over the snow peas, drain immediately then cover with cold water & drain again. Arrange the snow peas, mangoes, avocados, capsicum, spring onions, baby spinach, mint, coriander and bean sprouts on a big platter. Add the duck and toss everything together with remaining dressing. 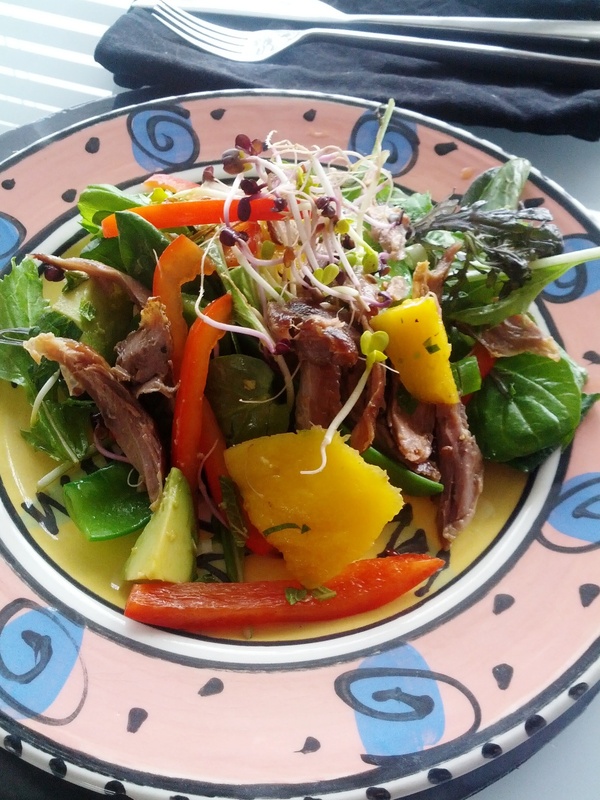 Inspired by Raewyn & Geraldine's free cookbook I decided to re-create this salad as we also discovered a little french cafe that sold it when we were in Rarotonga. I got to use the fresh basil that's overtaking my wee herb garden and some tomatoes off my one & only plant (must get more!). 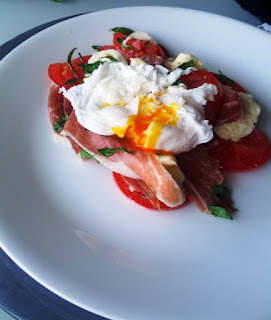 Poach the eggs & set aside. Slice tomatoes and layer onto large platter. Sprinkle small amount of sea salt over. Tear bocconcini or mozzarella into bite size pieces & layer over tomatoes. Cut basil leaves into thin ribbons and sprinkle over. 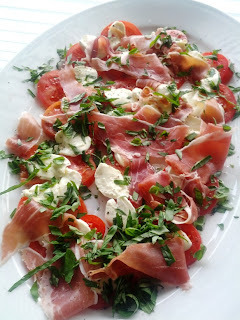 Tear prosciutto into smaller slices and place over the top. Drizzle with small amount of olive oil. Place a poach egg over the top of each serving. Enjoy! Everybody is talking about Chia Seeds. The richest plant based source of Omega 3 will enhance your endurance and keep you satisfied for longer. Throw it together with some cinnamon & honey and you've got yourself a "power" jam! Mix all ingredients together in a microwave proof dish. Cover with a paper towel and microwave for 3 minutes until the berries “burst”. Give it a good stir & add more water if it's too thick. Depends on how you like your jam consistency. 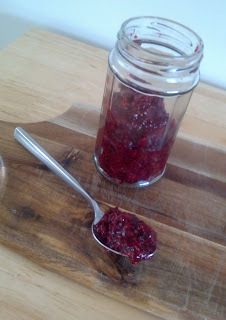 Pour into a glass jar and refrigerate until it sets. Spread onto toast for a healthy start to the morning. Enjoy! 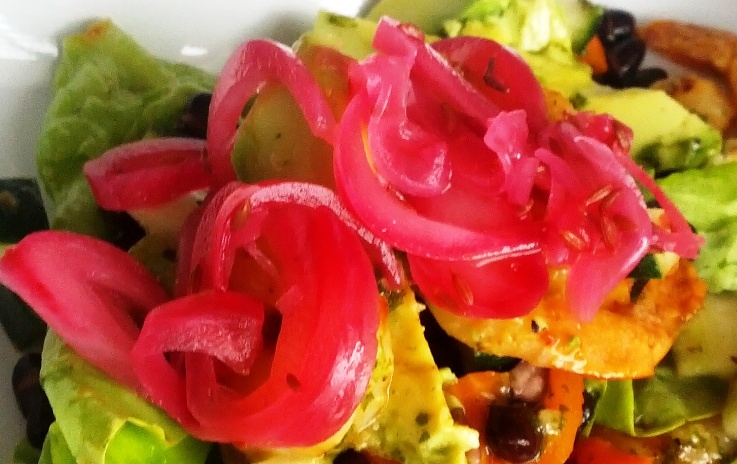 Inspired by Dish Magazines salad that uses black olives and firm ricotta. Experiment with what you have on hand, it's a beautifully refreshing salad and the harissa in the dressing gives it a wee kick. Pop all dressing ingredients into a jar and shake well. Scatter onion, tomato, radishes & olives on a platter & drizzle with a little dressing. 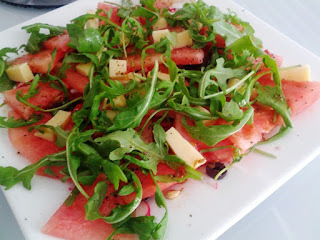 Arrange the watermelon wedges & cheese on top, slightly overlapping. 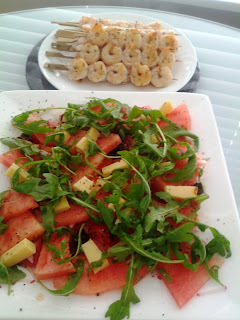 Scatter with remaining ingredients, the rocket & remaining dressing. Grind over black pepper and a pinch of sea salt. Enjoy! Goes well with grilled prawn kebabs. 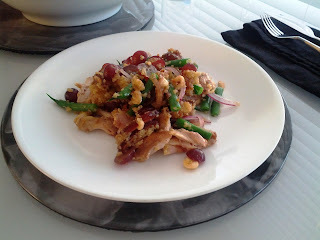 Another fantastic salad by Dish Magazine. I made a couple of changes & can't wait to make it again as I would like to try it with walnuts, pearl couscous and Agretti Fig Condiment. 1/2 cup hazelnuts, buy in shell, grab your hammer & shell - fun! Place in 180oC oven, roast until brown (about 10mins but don't stray too far as you need to keep an eye on the nuts as they brown quickly) Set aside, cool then rub skins off. Chop roughly. Place in a jar with some freshly ground black pepper & give it a good shake (after you've put the lid on of course ;). Pop in the fridge. Heat fry pan to a medium heat. Season chicken with salt & pepper & cook until golden and cooked through. I did mine for 5 minutes each side. Set aside until cool, then shred. Pour 2 cups of water in a saucepan & throw in a pot of Vegetarian Concentrate Stock. Bring to boil and add in 1 cup of quinoa, then simmer for around 10 minutes. Cool and drain. Rinse pot and 1/3 fill with water. Bring to boil, throw in the beans & cook for 40 seconds. Drain & place in ice cold water then drain again. Grab a big bowl & combine all the ingredients. Enjoy! Slice the onion very thinly (a mandolin makes light work here) & place in heatproof glass or ceramic bowl. Pour over enough boiling water to cover and leave for 20 seconds. Drain well & return to the bowl. Add lemon juice, salt & cumin & toss to coat. Cover & refrigerate for at least 1 hour (can be made 3 days ahead), turning occasionally. Drain & place in a bowl to serve.